Happy final Friday of the school year! We are excited for a fun last week of school celebrating the accomplishments of our students at our Annual Awards Ceremony on Tuesday morning and connecting with our community and having fun at our Field Day on Thursday. Students will be dismissed at 12:00pm on Thursday. We are looking for more a few more parent volunteers to help make and serve lunches with our field day. Please email Mr. Effland (deffland@summitps.org) if you are available. – Chromebooks and Chargers must be turned in by Wednesday at 3:00pm. If these are not turned back in for the year, students will either need to reimburse the school $300 per Chromebook, $15 charger or do 20 hours of community service for Chromebooks or 1 hour for chargers. This must happen before students receive report cards, transcripts, or receive new Chromebooks next year. Students will not be able to take home their Chromebooks over the summer. Students will receive a clean Chromebook next fall. – Thursday is the last day of school. We will have a field day and BBQ. Students will be dismissed at 12:00pm. Finally, congrats to the Activism Club for raising more than $500 for Coins for Change, which support a wide variety of charities (photo below). way to go Gomez, Randle, and Baba mentor groups for winning the challenge! As a reminder, students must pass 100% of their academic courses (English, Math, Science, and History, and Spanish if student is taking it) by June 22nd to promote to the next grade (this keeps students on track for admission to a 4-year college). If a student is not passing all courses by the end of the school year, he/she can attend summer school to pass the course as long as he/she has a maximum of four projects overdue or a maximum of 16 content assessments (PFAs). If a student has more than four projects overdue and is more than 16 content assessments (PFAs) to pass, he/she will not promote, will be assigned a new mentor group, and will be placed in the same courses next year. Dates of Remedial Summer School: June 18th – 22nd: 9:00am-2:00pm Students must attend all summer school dates until they are passing all courses. Unfortunately, we do not have space for students who are not failing courses. Dates of summer get ahead days will come in next week’s newsletter. Deadline to pass CAs and turn in overdue projects to avoid summer school: 3pm on Wednesday, June 13th. We are so excited to celebrate the academic achievements of our students at our Awards Banquet the Tuesday after next. Data for honor roll and Dean’s list was pulled on Wednesday, May 30th. Students who earned these GPAs by Wednesday, May 30th will be recognized at the banquet. Unfortunately, we are not able to make edits to the awards for students who bring up their grades this week because the slides, certificates, and invitations were created this week. However, students who earn this GPA by the end of the year can still note this honor on college applications. All families are welcome to attend the banquet (many of you received an evite too). Families who received a personalized email from Mr. Mendez will be given an award. Initial invitations were sent this week for attendance and Deans/Honor Roll, and more invitations will be sent next week for subject and school-wide awards. The Annual Awards Banquet will be held on Tuesday, June 12, 2018 at 7:30am. As our school year comes to a close, we take time to reflect and celebrate the achievements of our students. The annual Academic Awards Banquet is one way we come together to honor the hard work put forth by our scholars. There will be several awards given, including academic and other values-based awards. Two awards will be determined based on student achievement in the following areas: students with a 3.5 or higher will be on the Dean’s List, and students with 98% attendance will be awarded the Attendance Award. Breakfast will be provided. For more information, please contact Mr. Mendez at bmendez@summitps.org. All students will return their Chromebooks at 3:00pm on Wednesday, June 13th. Students need to turn in their charger and Chromebook. If a student does not return his/her Chromebook or any of this technology is broken, then he or she will receive a letter stating that they owe $300 for the Chromebook or 20 hours of community service over the summer. Students will not receive a report card, transcript, or a Chromebook next year until the fee is paid or community service has been completed. For more information, please contact your student’s mentor. Our last day of school will be on June 14, 2018. This will be an early release. Students will participate in Field Day and spend time reflecting on the year in their mentor groups. For more information about Field Day, please contact Mr. Irvan at rirvan@summitps.org. August 11th from 10am-2pm will be Mandatory Registration Day! All families must attend. It will be your opportunity to make sure all forms are turned in before the first day of school, get new Summit Swag, meet new teachers, have some food and receive your ORCA card. This is will be only day ORCA cards will be available. If you have any questions, please contact the front desk. Hello students and families! The school year is quickly coming to an end, meaning that yearbooks will be rolling out soon! If you’re are interested in ordering a yearbook please fill out this form: https://goo.gl/forms/xaWoBP3Wtdy2Yzvx1. A softcover is $21 and a hardcover is $25. In order to receive a yearbook, you’ll have to pay by June 10th. Please turn in money to the front desk, Kamaria Lyles, or Ms. Burns. If you have any questions or concerns please email klyles.si@mysummitps.org. We are seeking parent volunteers to help make our last day of school a success. On June 14, we will hold our annual “Field Day,” which is a day filled with reflection and competitive games that culminates in a special lunch. Last year was a huge success due to the amazing folks who helped out with lunch. Please email Mr. Effland at deffland@summitps.org if you can help with any of the above. Thank you! Sierra’s Activism Club is proud to host its first Coins for Change drive. Students are encouraged to collect and bring spare change to school to donate to a variety of causes. Every mentor group has chosen a specific charity to collect spare change for throughout the final weeks of the school year. The mentor group with the most money raised will earn a pizza party during the last week of school. Congratulations to the OG’s who are currently in the lead! For more information about the Coins for Change drive, please contact your student’s mentor or Ms. Visperas at cvisperas@summitps.org. 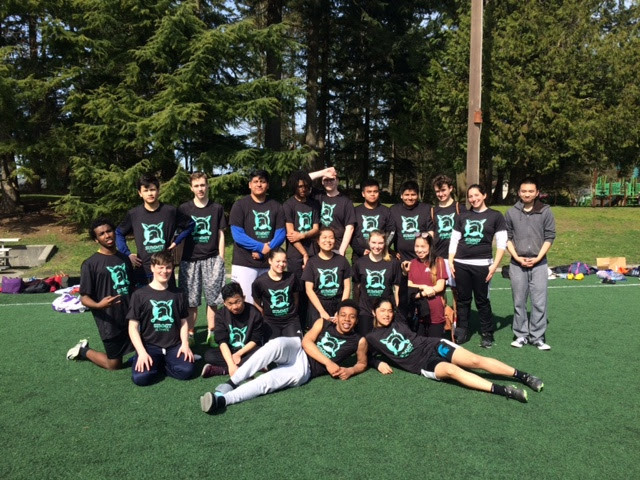 Congratulations to the Frisbee team who placed 3rd in the league! Please join us in recognizing each player the next time you see them. For more information, please contact Ms. Temes at ltemes@summitps.org or Captain Oscar Cortes at ocortes.si@mysummitps.org. Click here to read more about how your student can prepare for college this summer! Summer is a vital time where students can dedicate their energy to preparing for college and building their resumes. For more information about how your student can best utilize his/her summer to be competitive in college, please contact Ms. Nguyen at cnguyen@summitps.org.